See the buffalo? Made using the letters of the surname of this Native American of the Cherokee Nation. 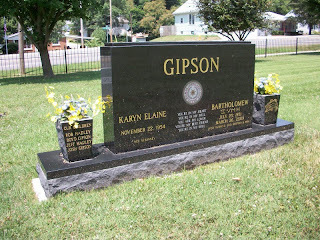 Bartholomew "Bart" Gipson was born in Cherokee County, Oklahoma 25 July 1951. He died in Vanderburgh County, Indiana 26 March 2009 (burial in Evansville Lutheran Cemetery). Living in Evansville for 30 years, working as a Social Worker (according to his obituary, as posted in the Browning Database). 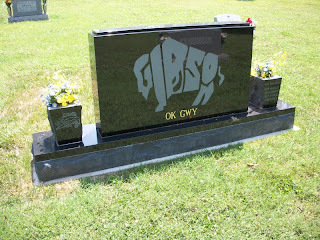 This is my husbands headstone.His mother was full blood Cherokee and his father full blood Choctaw. He was the 7th child of 10. The Buffalo was designed by he and his youngest sister Zena. All 10 siblings have license plates with this design as well as quilts and magnets and reunion T-Shirts. Bart was a very unique person and proud of this heritage. Thanks, Karyn, for your additional comments!